This course is designed for upper-level undergraduates who major or minor in sociology and is also open to graduate and law-school students. It reviews the most important developments, both theoretical and empirical, in the sociology of law. This is not a course in law, but in the sociology of law. The goal of the class is to understand some of the specific characteristics of the manner in which sociologists study law as well as to explain some of the patterns and dynamics of law in a variety of social settings. Upon successful completion of this course, students should be able to know and understand the manner in which sociologists study law and empirically analyze relevant dynamics of law and law-related phenomena in a variety of social settings. Successive sections of this course will focus on: classical theoretical contributions to the sociology of law; selected chapters in modern sociology of law; and a useful selection of empirical themes of law and law-related processes and structures to which the sociological theories will be applied. These empirical topics include, but are not necessarily limited to: law and economy; law and politics; law and culture; social structure and law; legality and legitimacy; the legal profession; law and inequality; and globalization and law. A necessary prerequisite for this course is any 300-level sociology course or consent of the instructor. The syllabus is available to all registered students via Blackboard. Mathieu Deflem. 2008. 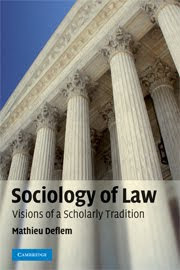 Sociology of Law: Visions of a Scholarly Tradition. Cambridge University Press. Kant, Immanuel. 1784. An Answer to the Question, "What is Enlightenment?". Graduate and law-school students have to complete all of the readings and assignments that are specified for undergraduates as well as several additional requirements. Supplementary required readings and further specifications of the assignments will be made available by the course instructor.